Soup makes for the perfect appetizer or small meal just about any time of the day. To go with that, the process of detoxing your body can really be as simple as eating one quick bowl of soup once or twice each day. Oh, and did I mention how great a body detox can be for your body on both the inside and out? 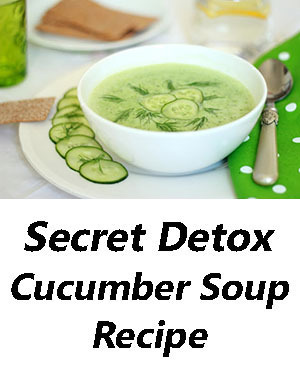 The easy detox cucumber soup recipe below is extremely simple to make using fresh foods that you can pickup at your local grocery store. Cucumber is renowned for cleansing the liver. To make this soup even better we also include avocado which adds healthy fats and a creamy texture for more great taste! Total prep time for this recipe is around 5 minutes and it will serve 4. 1) Throw all ingredients into a high-powered blender and blend on high speed until smooth. 2) Serve, garnishing with extra cucumber cubes and smoked paprika if desired. For those who are curious, this recipe makes a cold soup and not a hot soup. 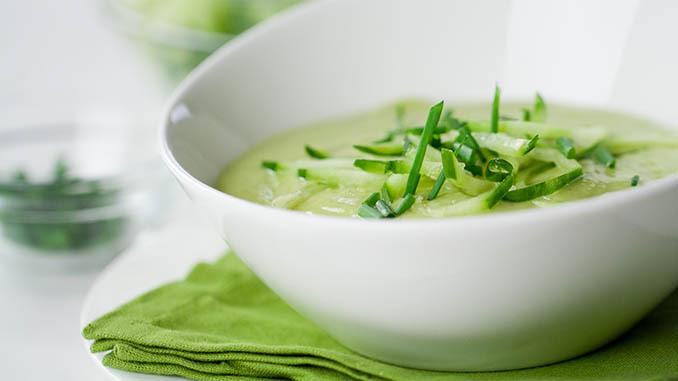 You can garnish your soup with cuke slices on top and smoked paprika for a beautiful look. Overall, it’s a rather simple detox recipe for a healthy meal you can enjoy anytime of the year for either lunch or dinner. Soup is easily portable, so feel free to make this soup and take it to work with you each day!